"Sticks and stones may break my bones, but names will never hurt me." That's what children chant when they are being teased; it's what their parents chanted, and probably their grandparents before them. Collected in this invaluable book are the wit and wisdom of generations of schoolchildren—more than 170 selections ranging from insults and riddles to jeers and jump-rope rhymes. 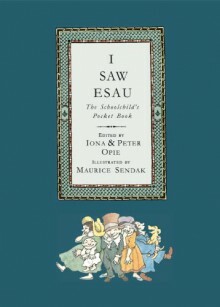 With Iona Opie's introduction and detailed notes and Maurice Sendak's remarkable pictures—vignettes, sequences, and full-page paintings both wickedly funny and comically sad—it offers knowledge and entertainment to all who open it.